Here are seven of the best kick scooter for commuting models available on the market at the moment. Each scooter generated strong customer ratings. The list is in reverse order, ending with the highest rated model. There are many good reasons to add a kick scooter to your commuting trip. For instance, they are great for situations where you’d otherwise be walking the whole trip, or for commutes that include public transportation. Weight, rider stability, and the smoothness of the glide are three important features to consider, as you will see below. 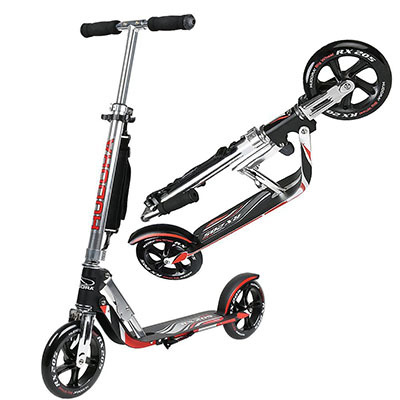 The Goplus Adult Kick Scooter offers a 100% risk-free satisfaction guarantee. Goplus stands behind the quality of their materials and workmanship. This scooter has extra-wide rubber wheels, with ABEC-7 bearings for a cushioned ride. The frame is made using tremendously strong, aircraft grade aluminum. The first selection on the list of the best kick scooter for commuter models is an adult rated design with a patented dual-suspension, shock-absorbing system. It also has a patented, aluminum rear brake that brings the scooter to an instant stop. The handlebar is telescoping, with three convenient settings. There is a wide platform that allows enough space for two adult feet. You can fold and unfold it in mere seconds. This scooter provides an ultra-fast glide. 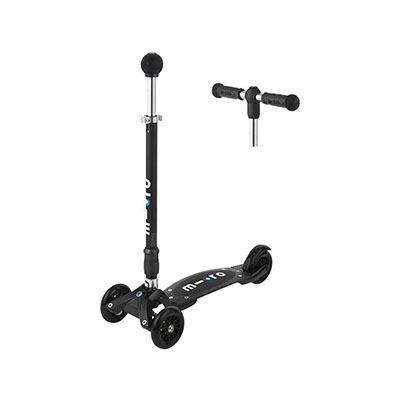 The XOOTR Adult Kick Scooter is the next highest rated choice in your list of the best kick scooter for commuting models. One nice feature of this scooter is the adjustable handlebar that works for adults up to 6’7″. It allows any height person to be comfortable and safe. However, it’s not recommended for wet surfaces. The Micro Kickboard has three high-grade, low-profile polyurethane wheels for a smooth ride over any surface. This model folds flat for convenient storage, or easy transport. This next option in your list of the best kick scooter for commuting models is the only with three wheel options. There is also a double, t-bar handle, plus a single stick for tricks. The Micro Kickboard Compact Interchangeable Scooter also has an impressive 2-year manufacturer’s warranty. 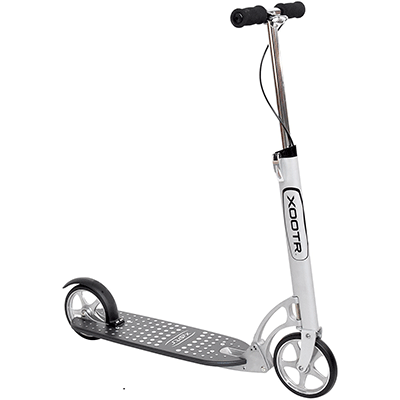 This scooter has aircraft-grade aluminum alloy. With a maximum motor power of 500W, this electric scooter is a great option for those who need a solution for commuting. One minus would be that it slows down if the person using it weighs more than 100 kgs, but all in all, it’s an excellent choice thanks to its design and special features. The large wheels allow for a smooth and easy-glide ride. There are adjustable handlebars with extra-soft padded grips. The VOKUL LUX Big Wheel Fold Kick Scooter can fold up in about three seconds and tuck under your arm. The next option on our list of the best kick scooter for commuting choices glides easily across bumpy or smooth terrain. It has a wider deck for easy control and safe commuting. 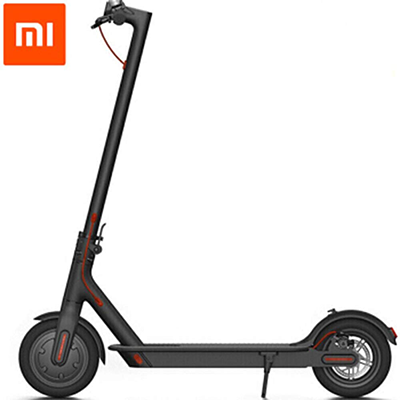 This scooter is rated up to 220 pounds/99 kilograms personal weight. 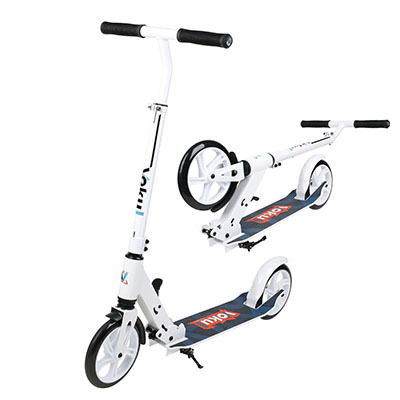 The LI YU SZ Hudora 230 Big Wheel Kick Scooter has a double kickstand to keep your scooter upright. There is an adjustable shoulder strap for hands-free carrying. This kick scooter is slightly lower to the ground, so it’s easy to kick and simple to control. 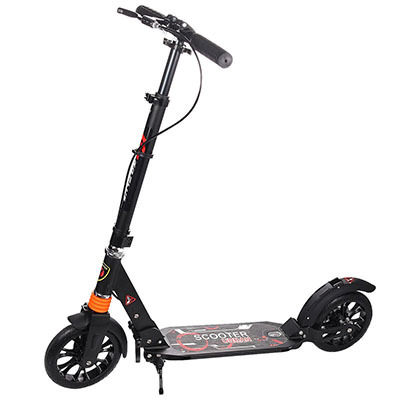 For traveling around down, back and forth from work, or school, the LI YU SZ is a candidate for the best kick scooter for commuting choices. The scooter folds up in three seconds and you’re on your way. This model has an extra large front wheel for easy maneuverability. The T-tube and deck shape is a patented idea from Razor. They fold together for easy transport. There is also a patented rear fender brake for safe, quick stopping on the Razor A Kick Scooter. 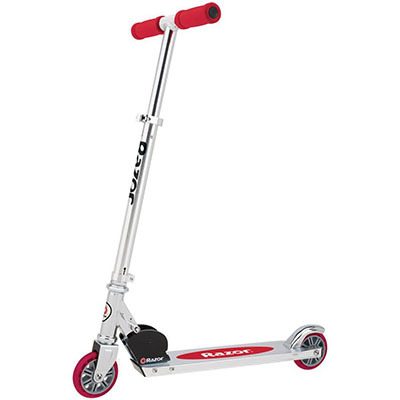 It’s the original kick scooter design, made from aircraft-grade aluminum with padded, adjustable handlebars. The final choice on your list of the best kick scooter for commuting options received nearly a perfect rating. It’s available in six color choices and a wide range of price options. Since it weighs only six pounds, you can fold it up under your arm and be ready to go when commuting. If you’re searching for the best kick scooter for commuting models, these are the seven highest customer-rated. Each has unique features, and all received an impressive overall rating. If you’ve used any of these kick scooters, tell us more about your experience. In addition, if you think there’s a better model we missed, let us hear about those.